Enterprises who have committed to migrate to cloud to provide scalability, flexibility and efficiency should not be surprised by reports that show threat actors have moved their infrastructures to cloud for similar advantage. 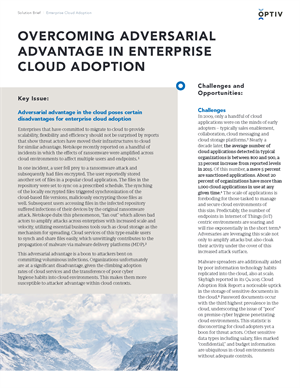 Organizations unfortunately are at a significant disadvantage given the transference of poor cyber hygiene habits into cloud environments, making them more susceptible to attacker advantage within cloud contexts. Optiv believes that many of the challenges posed by adversarial advantage can be overcome.